Sagittarius: New Moon in Gemini Tarot reading, 2017. The Universe wants to play with you again. Get excited! Happy New Moon in Gemini. I think for quite some time beloved, you have been resting, or away in your spiritual cave. Some people don’t know this about you Sagittarius, but I know. You often escape into your own world, where you figure out this world, and nobody knows you’re on a secret spiritual adventure. But I know! The 4 of Swords speaks on this time away you’ve experienced, this time of staggering confidence and low energy is now ending for you. The 2 of Wands is declaring that you are now in a new phase of your life. You may have recently come to a new understanding, or embarked on a new adventure, and the world is in your palm right now. I am so jealous of how amazing your cards are on this new moon! This new vision you have for your life is aligned with your magic. You are in a better place now. Mentally, emotionally, spiritually, and all of the above. The Magician is here to remind you that you ARE magic, beloved. You always find a way through every obstacle that arrives before you. You always have every tool, answer, or magic needed to get you through. Right now beloved, you are in a potent place of power. You are the magician, and the magic, on this new moon. Don’t be surprised if people feel envious of you throughout the rest of Gemini season. They don’t hate you, they just wish they had your radiance. The Ace of Wands is a thumbs up. Whatever you’ve been pondering on Sagittarius, the Universe is giving you a “yes.” This adventure or new beginning that you want to embark on, the Universe is fully supporting. Inspiration will hit you on this new moon. An opportunity will present itself that you cant deny. Not only did 3 more cards pop out for you because you are magical, but 3 amazing cards popped out for you. The Chariot, The World, and Death coming out together is a very powerful message. Beloved, you have so much charge built up inside of you right now. I would like to ask you, what are you doing with it? The world needs you, Sagittarius. You are here to show us what magic looks like. On this new moon, and for the rest of Gemini season, you are going to take your power back. Victory is yours. Luna is yours tonight. You are coming into a place of total understanding and completion. A very dark phase of your life is ending now. A dark and brittle part of you is now dying, and a brand new breath of life is entering inside of your lungs. You are blossoming. Breath in change. Breath in love. Breath in courage. Breath in magic. For your energy card, The Fool decided to show itself. I would love to go on this adventure with you. You are definitely on to something, beloved. What is it? Whatever it is, is beautiful, liberating, and divinely aligned to your greatest good and highest self. You are the most red rose in the garden. You are the flower that everyone wants to pick. Bloom at your own pace. Challenge yourself to see life, love, and yourself with brand new eyes. Be the Fool, beloved. Take a risk. Jump out of your comfort zone. Please don’t tell me you really forget that you have the ability to fly. The time is now. Time is waiting for you. That’s how magical you are. Choose happiness. And then beloved, choose it again. 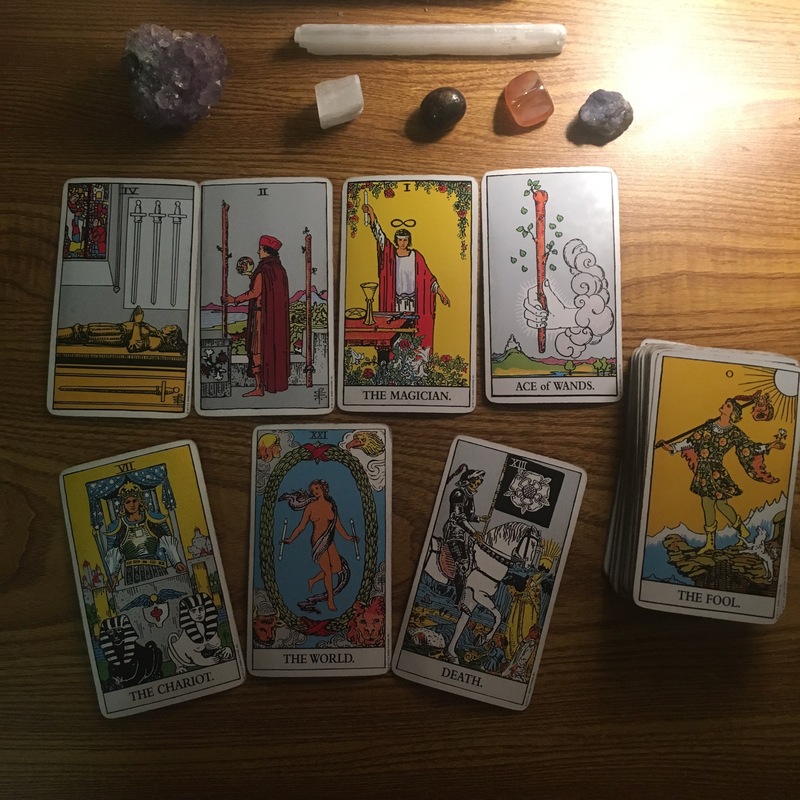 Previous Scorpio: New Moon in Gemini Tarot reading, 2017. Bring your darkness with you. It is your light. Next Capricorn: New Moon in Gemini Tarot reading, 2017. You made it to the top of the mountain. Now what?